The 14 foot “bunker” features army paraphernalia on the walls and ceiling, coin flooring, racks for The Laser Taggers, army style (ammo box) seating and room for spectators, so feel free to bring food and drink for the troops! 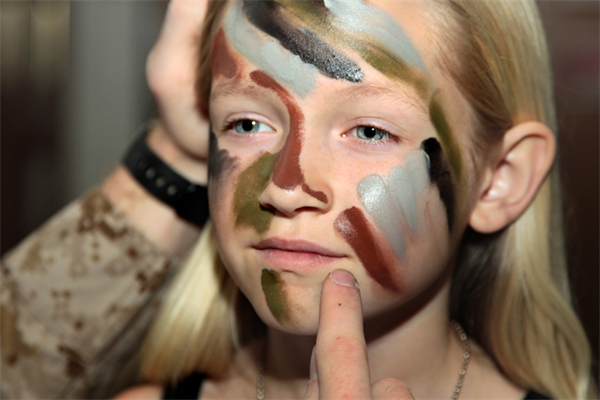 Time for face paint…it’s almost GO TIME! colors for team identification) and Laser Tag Training from the “Drill Sergeant.” Once ready, they’ll exit the Bunker as fully-trained teams and battle it out for fun, challenge and Bragging Rights! Free for All, Search & Destroy, Adults vs. Kids, Team Battle, VIP, Capture the Flag and others…with 8 built-in weapon options. Each weapon battle mode includes a unique sound, has a different range, damage amount, clip size, and fire rate. Backyard Laser Tag uses the amazing Battle Rifle Pro taggers! Our amazing Laser Taggers allow incredible options…switch weapon types with amazing realistic sound effects. Enable “autospawn” to allow players to rejoin the game after a set amount of time. Enable “Ammo Mode” to collect the ammunition of opponents after scoring a “hit.” Your guests will be amazed at this exciting system! If the “Recruits” get tired, hungry or thirsty, no worries…they can take a break in our climate-controlled Army Bunker, on seating made from genuine military Ammo Cans! With Backyard Laser Tag™, you only have to pretend to be tough! We’re available in and around the Pinehurst, North Carolina area.